Great for all level enthusiasts, the press is activated by simply pumping up its handle to apply 7 tons of force to the 6 x 2.5 inch plates. This fully automatic, exerting 3 tons of pressure press is easy to use. Just plug it in, set the timer and temperature, and enjoy fresh rosin! Our powerful 5 ton hybrid press is ideal for extraction facilities or seasoned growers looking for a high performance, push-a-button tabletop press. The DE10K hybrid press uses heat and electrically powered hydraulic pressure to produce high quality rosin with superior fragrance and medicinal value. The press moves its 3 by 5 inch plates gradually until the full 10,000 lbs of pressure is applied. Allow you to set the desired press parameters and monitor them in real time. The machine's hydraulic ram is powered by a simple pressing of a button. No hand pump, air compressor, or any other additional equipment is required to run it. Food grade stainless steel 3 x 5 inch platens with individual temperature controls guarantee uniform heat distribution and the premium quality final product. Integrated into the design, the safety sensor stops you from starting the press if your hands or any other objects are detected in the way of the moving parts. 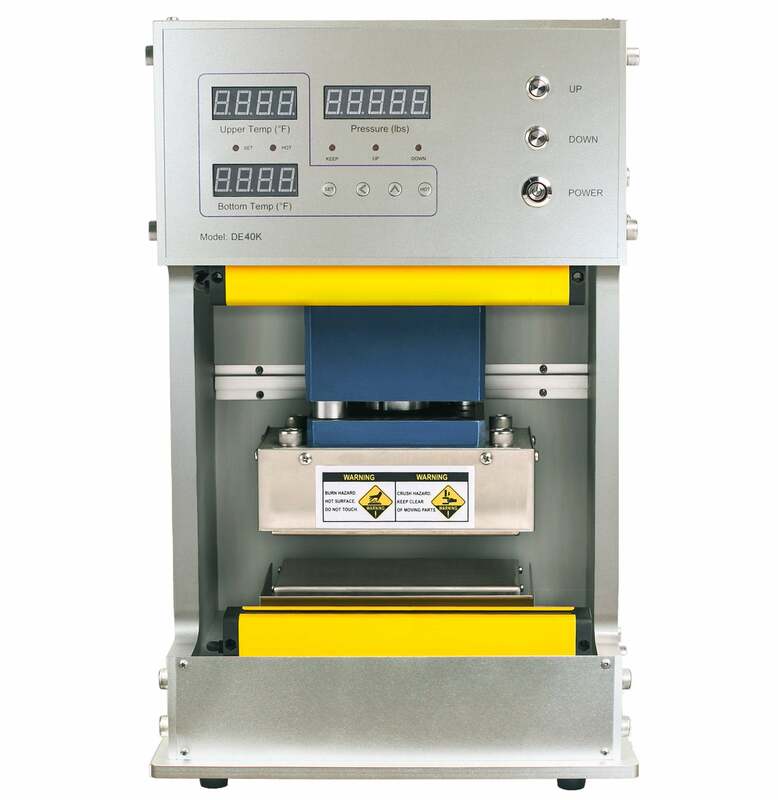 Affordable, lightweight, and efficient for pressing rosin on a smaller scale, the DM1005 machine is an excellent choice for an individual user. This model is available in two voltage versions: American 110 V and European 220 V.
Makes it easy to open and close the press. Lets you to adjust the press force to produce the best end product. Made of thick solid aluminum blocks for even distribution and retaining of the heat, the 3 by 5 inch platens can also heat up to different temperatures independently of one another. Allow you to easily adjust the desired temperature in °F and °C for both platens and monitor the actual readings during pressing. Please feel free to browse our products and email us your questions at help@dulytek.com. The guide is intended to help you select the correct rosin press for your application. For detailed information on presses, please refer to the product pages. Step into the future. I feel like a mad scientist running the dw6000, it pumps out gorgeous golden rosin at rates I never thought possible. I had very little experience pressing previously and spent lots of time researching the right diy project. I typically build my own, finding mass produced products for this market are typically junk. The DW6000 far exceeds anything I can build at this price. I waited a few weeks, pressing daily- running 4 strains both indoors and out before leaving this review. The results have been in the 20% range. The taste has been amazing and the results mind numbing. This press is very impressive right out of the box. You can tell it was packaged right for shipping, built like an ox, and very easy to operate. I did a lot of research on presses when I made the decision to get into making rosin. 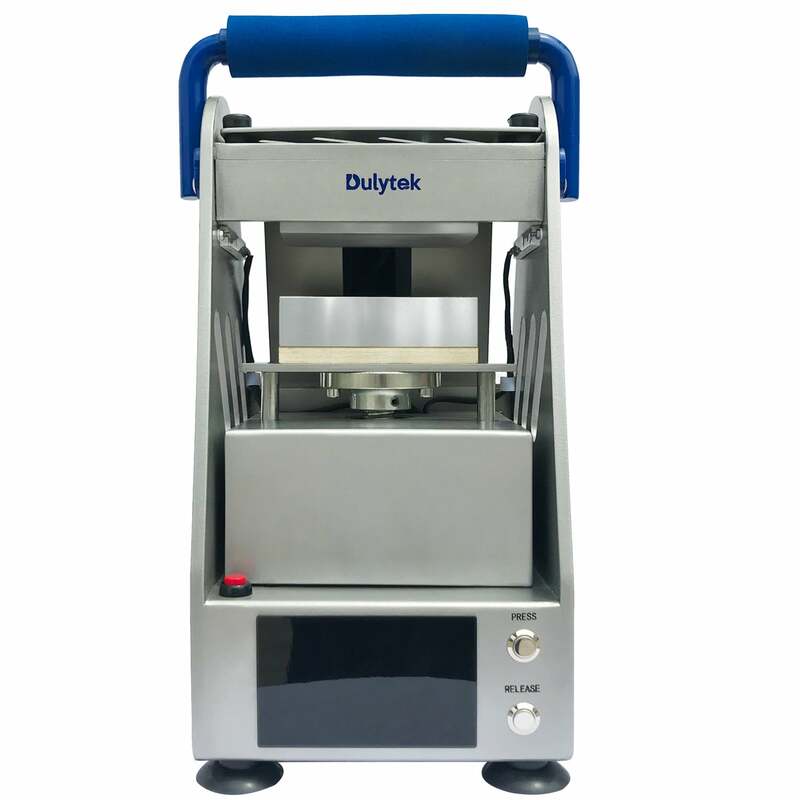 I almost got scared off when I started seeing the prices of presses until I came across Dulytek"s products and what they have to offer. The DM1005 was exactly what I was looking for and at a price I could afford. Great job! I replaced my Dulytek Manual press with the 6000 recently. Thought that was a beast. This is a way bigger beast and a half! As usual, built to last and actually a joy to look at. I did have to re-tweak my settings, as expected, but the results are even better that those achieved her with the DM1500. I am getting older, and pressing by just hitting a button and automatic release are greatly appreciated. That simple addition of the LED work light is pure genius. Thanks AGAIN Dulytek for getting this superb press at an excellent price point. The Dulytek is simple to use yet still fully functional. You cannot beat the price. I was extremely pleased and would not recommend any other press, you will be paying two to three times the price for only one or two more gimmicks. I highly recommend this press if you are looking for a good return and a fair price than look no farther. This is the best press for your money. I highly recommend this machine. 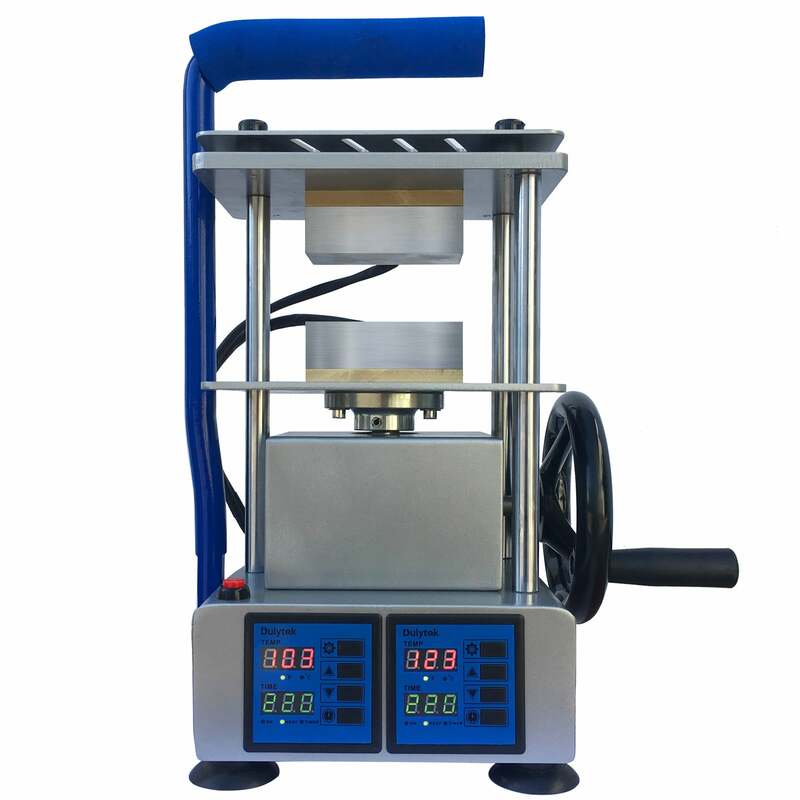 It is much more affordable than "My Rosin Press" , the heating plates are larger, more variation in temperature and generally better quality. I am getting about a 20% yield. All in all an excellent machine! It's very simple to press your own buds and return 20%+ yields. This is perfect for the home enthusiast who wants a couple of grams of solventless within quick pressing. It’s everything your looking for in a DIY situation. It has dual top and bottom temp settings, manual press with knob pressure and lock in full press, the timer really helps keep things consistent, switches between F and C degrees. I couldn’t ask for much more at this price range. It’s a step above the rest with price tag that’s very affordable. This automatic press is phenomenal for any rosin enthusiast, lab and for anyone who wants to upgrade their press or start off with a fantastic press that you get much more than you pay for. This press will last for ages to come with it's heavy construction. Not to mention it looks beautiful on my desk.